The importance of including instruction about the pronunciations and meanings of spoken words (oral vocabulary) within literacy lessons is well known to teachers. But the relationship between oral vocabulary knowledge and reading is complex, and aspects of the interplay between them are still not well understood. Oral vocabulary knowledge obviously helps with reading comprehension. That is, children must be familiar with the meanings of the majority of the words within a written sentence if they are to understand its meaning. This can be thought of as a late effect of oral vocabulary – first you need to identify the words, then you need to understand their meanings. But, did you know that oral vocabulary knowledge also helps children to accurately identify a written word in the first place? We know this from previous studies (McKague, Pratt, & Johnson, 2001; Duff & Hulme, 2012) showing that when children see a written word for the first time, they are more likely read it correctly if they have heard it before. What is not well understood by researchers is precisely how oral vocabulary helps children learn to read new words. What is it about knowing the pronunciation and meaning of a spoken word that helps a child learn to read it? Here we discuss some exciting findings from our research that shed light on this issue. What was the purpose of our study? We proposed, and tested for the first time, one possible mechanism that could explain the association between spoken word knowledge and word reading. We suggested that oral vocabulary knowledge assists children to learn to read even before written words are seen. How could this be? Well, when a child knows the pronunciation and meaning of a word, and they have some knowledge of how sounds in spoken words map onto written letters, they could put this information together to form an expectation about the spelling of that word (see below). [The formation of spelling expectations. Image: Supplied]. Where and how did we conduct our research? We conducted our research in a school in New South Wales, Australia, with children in Year 4. Children were taught spoken words they had never heard before. The words were presented as inventions from ‘Professor Parsnip’s Invention Factory’. Each had a name and a function. 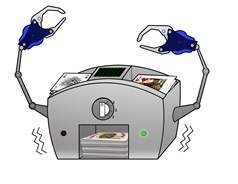 The picture below is a ‘nesh’, which is an automatic card shuffler. Children only heard the words during this phase – they never saw them written down. After training, the words the children had learned and some other words they had never heard before, were put into some simple written sentences. Then we asked the children to read those sentences. As they read, we used an eye-tracker to see where the children looked and how long they looked for. Eye movements provide information about how children are reading, in real-time. Written words vary: some have more letters, some fewer; some are very common, some less so. These features of words affect how easy it is to process them during reading, and this is reflected in how long children spend looking at them. When processing is easy, looking times are short but when processing is harder, looking times are longer. We thought that, if children do form expectations of the spellings of words they have heard before, then this should be reflected in their looking times. If a child had learned the spoken word ‘nesh’, they might expect to see it written as nesh. In this case, that’s the spelling we showed them. We thought that this match between what the child expected and what they actually saw should help their reading – they should look for a shorter period of time. On the other hand, if a child had learned the spoken word ‘coib’, they might expect to see it written as coib. Instead, we showed them a spelling they weren’t expecting – we showed them koyb. We thought this mismatch should be surprising and cause them to look for longer. We found exactly this pattern. If children learned a word and it was spelled in a way they expected, this helped their reading. But if the word was spelled in a way that children did not expect, then they were surprised. This suggests that children do form expectations of the spellings of words they are familiar with in spoken form, and this influences how children read new words. So, what does this mean for teaching literacy? These findings support what teachers have known for a long time – including oral vocabulary instruction within literacy lessons is important and will improve outcomes. Our research has shown, for the first time, that oral vocabulary knowledge helps with reading acquisition from the earliest possible point in time – even before written words are seen. When teaching new oral vocabulary, bear in mind that once children have heard a new spoken word, they are already guessing what that word might look like when it is written down. To do this, children are drawing on what they know about correspondences between sounds in spoken words and written letters. Reading instruction typically focuses on teaching written letters, and how these correspond to spoken sounds. Our findings suggest that teaching in the other direction – from spoken sounds to written letters – may also help children learn to read, by allowing them to form plausible expectations about how spoken words might be written. These researchers say oral vocabulary knowledge also helps children to accurately identify a written word in the first place. What strategies do you use to enhance your students’ oral vocabulary knowledge? Are there any particular oral vocabulary tasks or activities that work well in your classroom setting? Is this something you share with colleagues? Findings from this research say including oral vocabulary instruction within literacy lessons is important and will improve outcomes. How often do you include oral vocabulary instruction in your lessons?